45 (OP) Festival. K-9868. 1985. Produced by Greg Pethwig, Peter Sullivan & Ricky May. Recorded at Flagstaff Studios, Melbourne. Proceeds to the Australian Deafness Coucil. Side a: "A World Without Music". (Ricky May - Peter Sullivan - Jim Burnett). (Control). v: Hearing Aid. 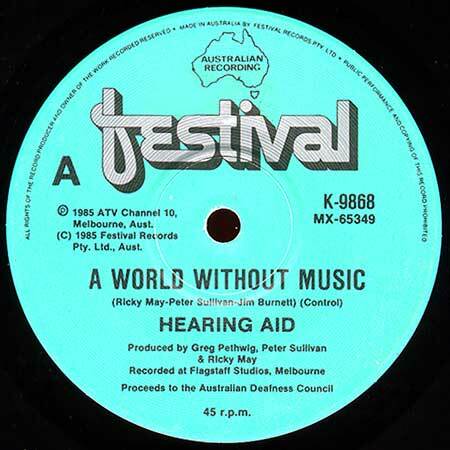 Side b: "A World Without Music". (Ricky May - Peter Sullivan - Jim Burnett). (Control). v: Ricky May. 45 (OP) Festival. K-9899. 1985. Side a: "The Sound Of Christmas". (Geoff and Anne Hales). v: Kerri-Anne Kennerley. Side b: "The Sound Of Christmas - Instrumental".